The smartphone, which will cost £199, is only available from Carphone Warehouse, but you can pick it up immediately if you think it's your cup of tea. We were expecting it to launch last week, so the phone's launch is a little later than we initially hoped. For such a low price it has some intriguing features, but with the Oppo Reno range of phones launching in the UK on April 24, it remains to be seen if the phone is worth the cost or if there will be Reno devices which are more deserving of your cash. What do we expect in the iPhone 11? What's in the Oppo AX7? The Oppo AX7 has some cool features that may well make it great value for money. First is the whopping 4230mAh battery, which is definitely on the upper end of the scale in terms of smartphone power packs, and we'd expect the phone to easily last a day on that. 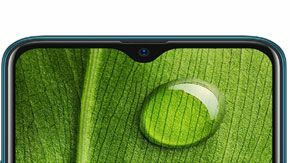 Oppo is calling the phone's design 'premium' pointing out the 'Grain Pattern' rear and the smaller 'teardrop' notch, which takes up less screen space, and houses the front-facing camera. To look at, the AX7 looks like a stock Android phone with a few tweaks, but premium design is as much about feel as looks, so we'll need to get our hands on the AX7 to see if Oppo is right. The phone has two rear cameras, consisting of a 13MP and a 2MP rear AI-enchanced snapper, and a 16MP front-facing selfie-cam. It's novel for a phone to have a more powerful camera on the front than the rear, but perhaps Oppo is on to something there. While these features may make the Oppo AX7 seem appealing, there's a catch – it only runs Android 8 (or ColorOS 5.2, which is based on Android 8), which may seem a tiny bit outdated to users of cutting-edge Android phones. To see how good the Oppo AX7 actually is, we'll have to test out the device and see if it's a great affordable handset, or if the low price is indicative of low performance, so check back to TechRadar when we write our full review.